Tools have always worked wonders when it comes to simplifying CSS-design and development related jobs. It is interesting to note that a huge majority of web designers and developers are excited about different CSS tools that allow them to create fully functional and completely optimized websites and web apps faster. 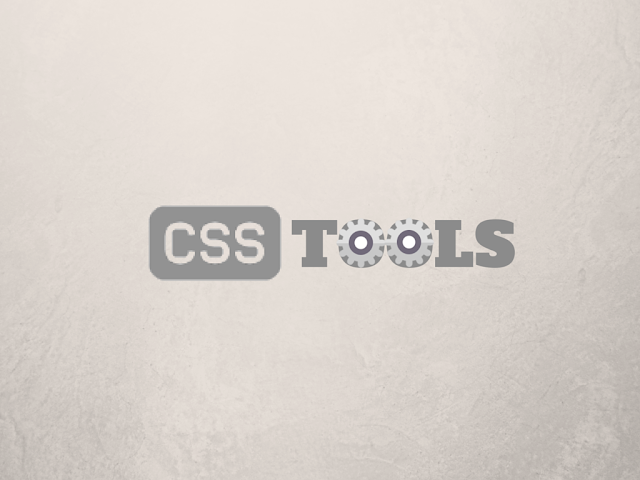 When it comes to executing some repetitive CSS taks, nothing works better than these truly commendable CSS tools. In this post, for you, I've collected a set of 25+ CSS tools that will aid you in building fantastic website via leveraging CSS features to the fullest. So, let's get going! As a remarkable typography tool for designers and developers, CSS Type Set allows you to interactively test and learn the way in which the web content can be styled. Within the 'Enter Text' text-area, you're required to enter the text that you want to modify and you'll be able to view the CSS for the same in the adjacent text-area named 'View CSS'. SpritePad is yet another CSS tool which allows you to create CSS sprites. All you need to do is simply drag and drop images into the grid and you'll be able to receive the same in the form of a PNG sprite+CSS code. The greatest advantages of SpritePad is that you don't need to assign the CSS styles manually and there's no need to fiddle in Adobe Photoshop. Conditional-CSS is a remarkable CSS Tool which allows you to write maintainable CSS using conditional logic for targeting certain CSS statements. This is being done for both, individual browsers as well as groups of browsers. With Conditional-CSS- a free and open source CSS tool, you can conveniently optimize your CSS, streamline the maintenance of your CSS files and avail the flexibility of automatic expansion and inclusion of @import statements. PXtoEM is a brilliant CSS tool which makes px to em conversions simple and faster. To get started with the tool, all you need to do is simply type a base font size in pixels and PxtoEM will create a pixel to em conversion table. This will make it convenient for you to produce elastic web designs conveniently. If you aren't familiar with the concepts of HTML or CSS and want to build a fabulous website, then Templatr is the tool for you. With a wide range of layouts to choose from, you are free to upload images and a plenthora of graphic elements. All the layouts that you create using Templatr can be quickly downloaded and installed using a specific application. One of the major advantages of Templatr is that it has been translated into multiple languages. You can go ahead with automatic sorting of your CSS properties with the CSScomb tool. The best thing about the CSScomb tool is that it can be effectively used with a wide majority of popular text editors including Notepad++ or Coda. Serving as an efficient means of beautifying your code, CSScomb is quite easy to install and configure. You can easily try CSScomb online by simply copy pasting your code in the provided box and viewing the combed code in the adjacent box. Prefixr is yet another interesting tool that allows you to add vendor prefixes in addition to making the stylesheet code cross-browser compatible. Prefixr will allow you to do away with all your CSS3 prefixes and instead you'll be left with a stylesheet that uses the official syntax. That means, you aren't required to remember any specific CSS3 property simply because Prefixr has all this information built within its program. PSD2CSS Online is a high-end CSS tool which will generate web pages from your Photoshop designs. You are free to choose from a wide collection of guidelines and naming conventions on how the transformation from PSD to (X)HTML and CSS needs to be performed. Creating cross-browser compatible custom CSS menus is made flexible and easy with the CSS Menu Maker tool. Whether you're interested in creating a drop-down menu, a vertical menu, an accordion, a flyout or any other kind of menu; CSS Menu Maker is the tool you can't afford to miss. CSS Frame Generator is a tool which returns CSS in a line-by-line way so as to reflect the XHTML structure. To get started with using the CSS frame generator tool, all you need to do is simply put the XHTML code in the available text-box and one of the trained professionals at CSS Frame Generator would provide you the corresponding CSS frame for your XHTML code. CSS Redundancy Checker is a tool which allows you to find all the CSS selectors which are no longer used by any of the HTML files and hence may be redundant. The sole aim of CSS Redundancy Checker tool is to keep all your CSS files compact, utmost relevant and accurate. Awesome Fontstacks is an impressive CSS tool which allows you to create bundles of free, beautifully matching web fonts. If you're looking for exploring innovative possibilities in the world of web typography, then Awesome Fontstacks is the tool you can't ignore for sure. Serving as a remarkable online form building tool, Wufoo comes with a web-based HTML form builder that can be used for building eye-catchy XHTML and CSS-based forms. So, whether you're looking for creating online surveys, contact forms or invitations; Wufoo is the CSS tool you'll find handy. Clean CSS is a perfect online tool that makes the process of sorting and maintaining the order of selector properties easy and quick. Since selector ordering can easily alter the intended behaviour, it is recommended to be careful while Clean CSS tool sorts your selectors. As a yet another impressive tool for cleaning up the HTML code, WordOff will remove all the unnecessary elements like <span> s, <font> s and <div> s, empty spaces, style elements and attributes. Additionally, it will also allow you to get rid of all dead whitespace and other bits of code that tend to break the HTML page. CSS Compressor is a CSS tool that allows you to save on important bandwidth while compressing your CSS. You are free to choose from three levels of CSS compression. I recommend choosing the “Normal” mode for compressing your CSS. If you're looking for a look that will enable you to convert your Photoshop layer styles into CSS3, then CSS Hat is a must-try. With this tool, you can simply select multiple layers and receive the CSS code for each layer along with separate selectors. As a simple HTML table generator, Kotatsu allows you to attach classes to cells within the same column instantly and easily. Htmldevelopertools allows you to update your CSS files on the server within a browser window. While Htmldevelopertools is currently working under IIS + .NET 3.5, it can definitely turn as the greatest asset for designers and developers. With the CSS Text Wrapper tool, you can conveniently make your HTML text wrap in several shapes instead of just a simple rectangle. You can go ahead with wrapping the text around zig-zags, curves or whatever shape you want. If creating a grid by specifying number of columns, margins and gutters has become a stressful job, Grid Designer 2.4 is the tool for you. In addition to specifying the typography within the tool, you can also avail the flexibility of bookmarking your grid and creating designs with spanning columns. Available as an open-source tool, WebPutty allows you to edit the CSS online in addition to being able to preview everything that you're doing and further publishing your work with a single click. This is a fabulous tool which allows you to change the entire color scheme of your website without touching even a single piece of CSS code. All you need to do is simply choose a local CSS file, replace the colors and download the new CSS file instantly. If you aren't comfortable with creating a gradient using Adobe Photoshop, then go ahead with using CSS Gradient Generator tool for the same. With this tool, you can even avail the flexibility of saving all your gradients using a unique link. Working with CSS become simple and exciting when you've the right tools available by your side. Here's hoping the ones featured above would allow you to get going with exploring your CSS journey in the best way. I am Savy Nacion, working as a technology specialist in Designs2HTML - HTML to Wordpress services providers company, based in Rochester, New York. With over 10 years of experience in the technology domain, I aim at bringing new and innovative technology solutions to the company to help it keep thriving in the industry.